This device operates like a magnifying glass; it has the additional benefits to display high-resolution results. This helps industrial sectors to view things in a clearer manner. This device has full-color LCD display. India Tools & Instruments Co. is among the chief Handheld Digital Magnifier (25X) Manufacturers, our quality is the badge of our excellence. This is a portable product, hence can be used at any kind of location. Its large LCD displays helps you to see the things in a better way. This device is mostly used in industrial sectors. Our products like Digital Magnifier and Handheld Digital Magnifier are genuinely tested by our experts, to avoid any kind of error. We serve a wide range of products at a very affordable price. Our quality speaks for ourselves. To know more you can call us or can drop your inquiry to us. 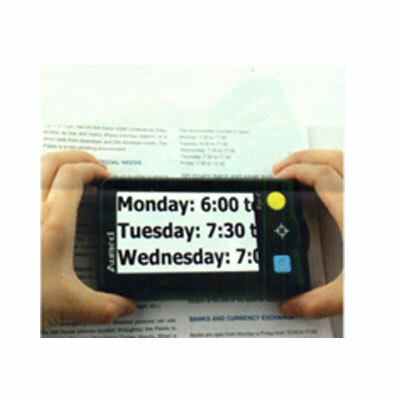 The 4.3 inches Handheld Portable LCD Digital Magnifier is an idea on the go digital magnifier for people with visual difficulty. It has 7 colour modes for different visual impair situation. The magnification can be up to 25x. Freeze function helps you to fix and keep the current screen image. After full charged, its rechargeable li-ion battery provides a working time up to 4 hours. TV-out (to any monitor with TV-in) helps to get larger display.